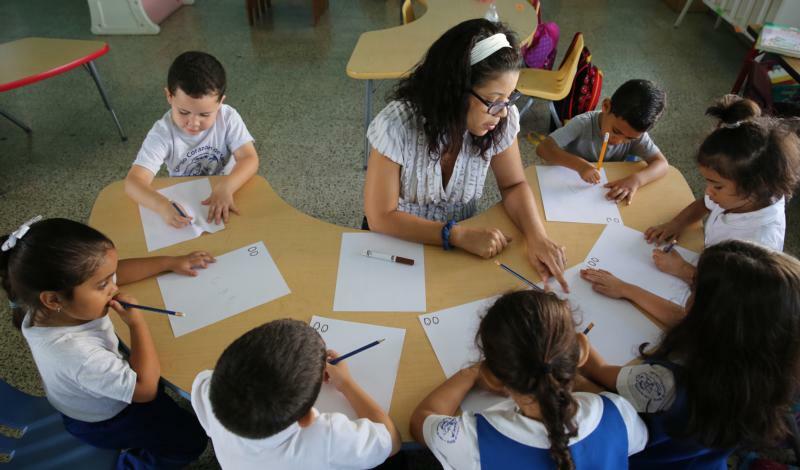 Maria Santiago works with her prekindergarten students in 2017 at Good Heart of Mary Catholic School in San Juan, Puerto, Rico. While it is now widely known that Latinos are the fastest growing segment of the Catholic Church in the United States, Latino children continue to be underrepresented in Catholic schools. There are an estimated 14.5 million Catholic primary and secondary school age children in the United States, eight million of whom are Latino, according to a 2016 Boston College study. Yet less than 4 percent of them attend Catholic schools. There are many reasons for this. The total number of students enrolled in U.S. Catholic schools is less than 1.9 million, a fourth of the total number of Latino children. Moreover, the majority of schools are in the Northeast and Midwest, while most Latino children are in the South and West. While most Catholic Latinos were born in the United States, many immigrant families come from countries where Catholic education is only for the wealthy. They may not even have considered it an option. The underrepresentation of Latinos in Catholic schools is no small matter. The Pew Research Center estimated in 2015 that half of all U.S. adults raised Catholic leave the faith at some time in their life. But children who attend Catholic primary schools are more likely to remain Catholic as adults and more likely to consider a vocation to religious life or the priesthood, according to Georgetown’s Center for Applied Research in the Apostolate. Thus the low Latino enrollment in Catholic schools could help explain the low number of Latinos ordained to the priesthood. Beyond religious vocations, the National Catholic Education Association reports that nearly all students who attend a Catholic high school graduate. Of those, 86 percent go on to a four-year college. Knowing that the future of the church will largely be in the hands of Latinos, it is paramount that Catholic schools help form them in the faith and help them become our future leaders. To do this, the church needs to foster a culture of Catholic education among Latino communities. Catholic school leaders must take it upon themselves to know their community demographics and cultivate relationships with community members. Catholic schools, through their curriculum and environment, ought to be places where Latino children feel at home. This culture of encounter in Catholic schools should also permeate Catholic colleges and universities, where Latinos make up only 11 percent of the student body. The underrepresentation of Latinos in Catholic schools is no small matter. Since these steps will increase Latino enrollment, the church will need to build more Catholic schools, especially in the South and West. The church in the United States has everything to gain by taking these steps. Over the last 70 years, Catholic school enrollment has plummeted from five million to less that 1.9 million. Latino communities are steeped in family values, respect for elders and hospitality. Their vibrancy can reinvigorate the Catholic school system and the church as a whole. This is a time to celebrate once again the goodness of the many great cultures God has brought together in the United States. The church is on the verge of a new springtime. The church needs to develop a comprehensive strategy to catechize all Catholic students, whether or not they are enrolled in Catholic schools. Let this school year be the beginning of the paradigm shift we need to start becoming a church that welcomes immigrants not just through the doors of our churches but also into our classrooms. Latinos are church's last hope in USA. Latino kids last able to be so indoctrinated. But it's only a short term solution. Charter Schools, Profit & Non Profit receive public funding for education. I understand the reasoning of Seperation of State and Church. But unless I’m wrong, the vast marjority of teachers are lay teachers and not Nuns and Priests. Could not Religion Classes be taught out of the school in the neighboring Church ? I believe the Catholic Schools accepts students of different Faiths although I suspect many of these students now attend Charter Schools with no tuition. Many Catholic Schools have closed from financial pressures and decrease enrollments. The average high school cost to attend a Catholic School is $ 10,000 per year, this is the reality. The American Conference of Bishops need to get off their butts and start thinking outside the box and find a way to bridge the gap of being recognized as Free Tuition Charter Schools. As a retired teacher and someone who is concerned about maintaining the vibrancy of the Church, I agree that welcoming and encouraging Latino children to attend Catholic schools is important. I also feel very fortunate that I was able to attend sixteen years of Catholic schools. However, it will take a tremendous investment, both financially and spirtually, to achieve greater enrollment in Catholic schools, not only for Latino children but for children of other ethnicities as well. Since the overwhelming majority of teachers in our schools are laypeople who as a matter of justice must be paid a living wage, it will almost certainly require higher tuition for parents of schoolchildren. These two possibilities would only be partial solutions. It's an unfortunate fact that in recent decades the number of religious sisters has dramatically declined (many years ago, most of the faculty of Catholic schools were nuns, religious brothers and priests). Although I applaud the various ministries in which many order of nuns now are engaged in, perhaps some members of communities of sisters can be encouraged to become teachers. Also, perhaps Catholic business owners who are financially well off can be convinced to contribute a portion of their profits to build and maintain Catholic schools. Perhaps other educators and well-informed laypeople can come up with other solutions. United States Americans are a threat to all immigrants but especially Latinos who, like me, are immigrants, come from impoverished, poorly educated families, but a strong sense of cultural family identity. Latinos have an exponentially greater amount of good to offer US Americans while the latter are a people gripped with contagion. For every Latino that enters this country, 10 US Americans should be exported to Latin American so as to deprogram their pride, greed, sloth, gluttony and dark souls. The return on investment for immigrants is offset by the toxic culture the US imparts on immigrants. Immigrants are the answer to US Americans lost culture, besides extinction ala Charles Darwin Natural Selection. But who will protect the immigrants from US Americans? An excellent "call to arms" for making the Latino Catholic population more present in our school communities. Perhaps the Catholic University of America or another Catholic institution of higher education could create and develop and find a home for a Center for Latino Catholic Studies with an eye toward substantively increasing the number of Latino Catholic students in the Catholic schools in this country. The Center could form future leaders for new schools that might be built to meet demand in Latino population areas. This is an idea that Michael Sean Winters at CUA has previously espoused. This population is our future. We need, however, to make serious efforts NOW to consider the funding that will be necessary to achieve these goals for the Latino community, which is underrepresented, at least in part, because of the socio-economic status they occupy. If Catholic schools are not to be havens for the well-off, how do we fund an effort to increase the opportunities for Latinos? First, we need creative means of financing which might include real estate development on the part of a forward-looking diocese or two. Second, we need the brightest financial minds at our disposal to help us create models that will sustain efforts in Catholic education for the long haul. Lastly, we need to re-direct our priorities in the Church and acknowledge the pivotal value of Catholic education from early childhood on in terms of passing on the deposit of faith and in terms of spreading it so others may reap its fruits. Latinos have an important role to play in revitalizing the church. I think that Latinos have an important role to play in revitalizing the church and Catholic schools too.Yes, I'm a teacher and writer from https://domywriting.com but Catholic schools that have reached out to Latino families through tuition help, more Hispanic teachers and a more welcoming environment have seen an increase in Latino enrollment. This article also appeared in print, under the headline "Opening Doors to Latino Students," in the October 1, 2018 issue.